to email the companies to change the way they operate in China. The firms have aided or colluded with internet censorship in the country, the human rights watchdog says. It is asking the internet giants to reveal which words they have banned from blogs in China or filtered out of web searches. 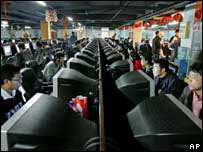 The technology firms say they are helping develop more freedom in China. But Amnesty says they are helping to reinforce censorship by the Chinese government. "Yahoo!, Microsoft and Google claim they are obeying local laws when in fact they are succumbing to political pressure," Kate Allen, Amnesty International UK Director, said. "We want them to hear from customers here in the UK. "If enough people tell them they're not happy with their actions in China, we hope it will make them think again." But the technology companies argue they are simply working within the laws that exist within different countries and are actually helping by making more information available. "People in China have access to far more information today than they did five years ago - and by being in China we will help further that development," said a Google spokesperson. These views were echoed by Yahoo! "We also believe our presence significantly benefits a country's citizens through access to services and information," said Mary Osako, spokesperson at Yahoo!